It is no surprise that many people, including people of Indian origin, know much about their ancestor’s role in the World Wars. There is even less known about the Indian armed forces before the First World War. Other than historians and army buffs, much of the sacrifices made by the Indian army is largely forgotten. It is important that we own this knowledge and heritage as it provides the clues to our present and our future. The Indian sub-continent has been bestowed through history with its own unique systems of military and conflict strategy. It dates back to even the ancient scriptures. However, in the modern context, the structures can be traced back to a company that made much of the trade in the Indian subcontinent during the British Raj. You may be forgiven to see some of the modern multinationals as powerhouses driving the world’s economy. But history will show that The East Indian Company was most powerful and dominant that the world had ever seen. Concerned with fear of Spanish and Portuguese trading in the east, the British and Dutch began to take an active role in gaining a firm foothold in the region. The Dutch, in particular, were focusing on the spice trade and peppercorns. The British worried about being left behind decided to take action. On the 31st of December 1600, Queen Elizabeth 1 granted more than 200 Englishmen the right to trade in the East Indies as it was called. Starting with a few investors, the British ships began to bring in much needed and highly profitable spices and other goods on the shores of Britain. However, with fierce completion, added with wars and pirates made trading less profitable. The East India Company could not compete with the more powerful Dutch East India Company in the spice trade. Thus, cotton and silk became the new tools of profit for the company. And by 1700s the company became the dominant force in world textile trade. It even amassed its own army to protect its interests. This army’s main concern was to protect its staff and goods. However, in 1757 with the Battle of Plassey, the company had to defeat an insurgency in the regions. From then on the East India Company started taking on full administrative power over its territories. The administrative structure of the East India Company was divided into three Presidencies of Bengal, Madras and Bombay each with its own army. Thus, the first Indian regiment was raised after the battle of Plassey in 1757 called 1st Bengal Native Infantry. The soldiers based in the Bengal Infantry were not necessarily from the region. In fact, the rank and file were primarily from the United Provinces and Bihar. This regiment saw more service than its counterparts in the Madras and Bombay Presidencies. Thousands of Indian men of all religions wanted to join the army. Other than the provision of some earnings and facilities, one of the main reason for joining was linked to respect and honour within their villages. Joining the military was and is still seen as honourable (izzat) and patriotic. A century after the Battle of Plassey and the continued growth of imperialism, India was up in flames in 1857 when a mutiny was carried out by the Indian regiments. This result in the East Indian Company losing its power and the Indian Government was directly controlled by the Crown. There was a mass reorganisation of the army as many regiments as previously been disbanded in the aftermath of 1857. The other big change was the proportion of British to Indian troops was now to be one to three and the field artillery was all to be in British hands. The repercussions of these changes were acutely felt when the First Wolrd War began. The British had a theory that certain communities were more martial than other groups. This theory of Martial Races led to the selection of soldiers composed of men from the Punjab and the North-West Frontier – Sikhs, Punjabi Muslims, Dogras, Jats, Pathans and also the Gurkhas. By the mid-19th Century, the Indian army was well versed in warfare with multiple engagements. It was involved in the frontier battle against the independent tribes along the North-West Frontier. It was these frontier wars and consistent active service that made Indian soldiers hardened soldiers who were extremely proficient in mountain warfare tactics. The soldiers saw service in other regions including Egypt, Sudan, Abyssinia, British Somaliland, Jubaland, British East Africa, Aden, the Persian Gulf, Persia, Afghanistan, the North-East Frontier, Tibet, Burma, Malaya and China. In 1903, Lord Kitchener who had become the Commander-in-Chief reorganised the Indian Army. All the regiments of the Bengal, Madras and Bombay armies were brought into one line and restyled and renumbered. The Gurkha regiments were grouped separately. The Indian Army structure and somewhat distinct and unique. A soldier in the Indian infantry was a sepoy or rifleman (in the case of a rifle regiment) and a sowar (rider) in the cavalry. 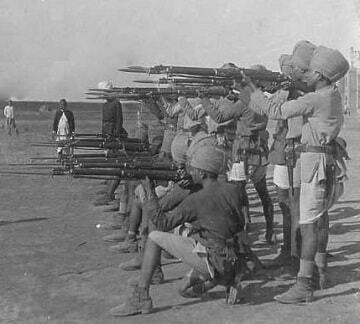 The men were commanded by British officers, but it was ‘Indian Officers’ who were the vital link between the British officers and their men. They would advise the British officers in matters relating to the men and were role models to the men. They were the prized individuals of what they could become and achieve. These Indian officers were also known as Viceroy’s Commissioned Officers (VCOs) being commissioned by the Viceroy. In the infantry, their ranks were jemadar, subadar and subadar-major while in the cavalry they were jemadar, risaldar and risaldar-major. 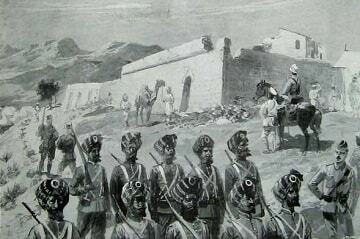 They were ‘officers’, saluted by the men and at easy social terms with the British officers who called them ‘Sahibs’. However, even though they may have been veterans with nearly 25 to 30 years, they were still junior to the junior-most British subaltern. The subaltern that did not take the Indian officer’s advice did so at his own peril and such a decision was considered unwise. As previously mentioned, being an Indian soldier resided positively with the communities as izzat and respect were a catalyst to joining. Sons often followed fathers into the same regiment and the regiment was an extension of one’s family. It was a home away from home where men served with kinsmen of the same village or district for several decades. The colours of the regiment, nishān were sacrosanct and would be defended to the last man. This was the Indian army that was mobilised in August 1914 and went to fight in the Great War, adding greatly to its prestige, upholding its traditions and keeping intact its izzat or honour.